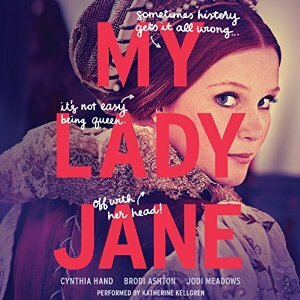 My Lady Jane by Cynthia Hand, Brodi Ashton, and Jodi Meadows. Narrated by Katherine Kellgren. Grades 7+. HarperAudio. 13 hours 47 minutes. Review copy provided by publisher. Take everything you thought you knew about King Edward and Jane Grey and throw it out the window. You've been told wrong. You don't have the whole story. And here it is, for the first time. This is a wild romp through a reimagined Tudor England where a portion of the population can shape-shift into animals. A teenage King Edward sits reluctantly on the throne, dying of The Affliction. On his deathbed, he signs over the throne to his cousin, Jane Grey, a teenage girl who's recently been married to a nobleman's second son who turns out to be a horse (well, half the time, anyway). Hi-jinx ensue as Jane, her husband Gifford, and Edward get caught up in a conspiracy to seize the throne. The tone of this book is similar to The Princess Bride and it's a wacky story that doesn't stop for a minute. There is a strong romance, but the action never goes farther than kissing (and occasionally contemplating consummation of the marriage, but never in detail), which makes it a good choice for younger teen readers or teens who like romance but aren't ready for hot and heavy action. This is a book with a really strong feminist message wrapped up in a fun story. Jane stands up for herself, even as she's caught in a society that restricts her to certain roles. She's a bookish heroine to the extreme, even encouraging wedding guests to bring a book to the ceremony in case they get bored. Fun and funny in its own right, the audiobook narration really elevates the story, Master narrator Katherine Kellgren gives a fully voiced performance for a large cast of characters with a wide variety of British accents. I especially appreciate Kellgren's mastery of volume as she reads - she is completely able to yell without getting shrill or blasting the listener out of their seats. I was literally laughing out loud as I was listening to this one, both due to the writing and the narration. Definitely The Princess Bride by William Goldman for its similar wacky and adventurous tone. Readers who liked reading about British royalty (even though a lot of it is imagined) might enjoy The Raucous Royals by Carlyn Beccia. And readers may be looking for books that will give them the real story of the Tudors, so keep nonfiction and other historical Tudor fiction in mind.